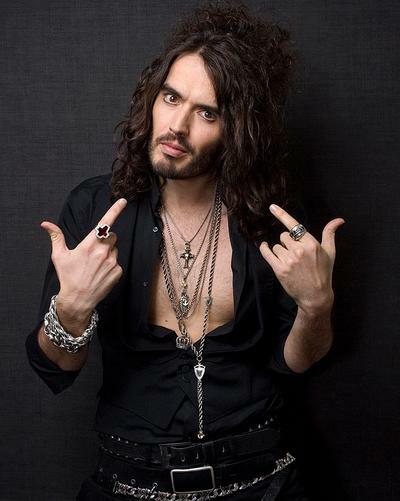 Russell Brand is a loveable rogue isn’t he? But what makes him tick? Well firstly there are 13 constellations that sit on the ecliptic (path of the Sun) not just twelve refer to the link at Siderealist to find out why. You can also look up your true Sun Sign too. 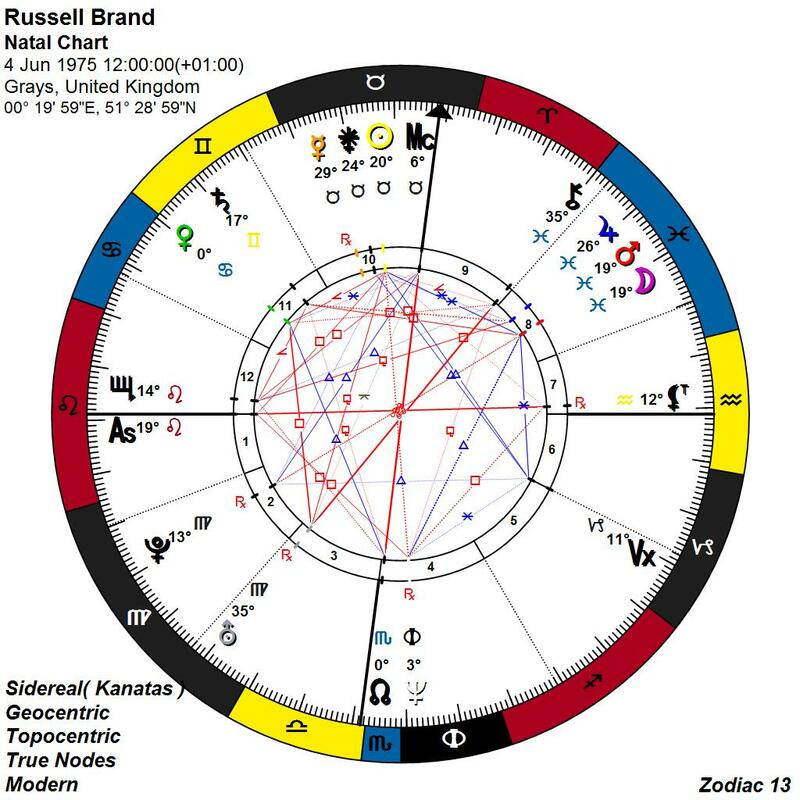 In this instance Western Astrology tells us that Russell Brand’s Sun is in Gemini when really it isn’t! If you look at any real time map of our skies you will see that it is actually in Taurus; however don’t take my word for it, take a look yourself! With his Sun in Taurus Russell is on the whole, a reliable and solid individual with a deep need for stability and routine, this is most likely down to his strong need for security, but don’t dare rattle his cage otherwise you will witness the strong and stubborn bull, this is emphasized by his Sun also in trine to Pluto, which makes him an extremely powerful person with strong leadership skills. Russell’s Sun is also conjunct Mercury, (Mercury is Gemini’s ruling planet) this makes him an effective communicator who needs quite a lot of intellectual stimulation, however, his way of absorbing information, will be slow and methodical. Mars in Pisces conjunct to both the Moon and Jupiter Shows that there is a strong drive within him to follow a spiritual or worthwhile path, Russell is intuitive and his energy level s are high, this courageous guy will dare to go where angels fear to tread, this side of his nature being quite impulsive and emotional, although his exterior exudes a gentle generous facade full of optimism and self confidence, inwardly though the story is very much different. Russell places a lot of emphasis on family relationships and forms strong emotional bonds especially in intimate relationships, but with his Venus square Neptune and Chiron, Russell is prone to become restless and lacks commitment, his willfulness stops anyone getting too close to him, especially if he feels they might just be a fret to his free expression. Or maybe, he just needs to be sure that the person he is with is solid, reliable and stable, since he finds it difficult to enjoy the beauty of intimate relationships due to childhood experiences, where he may have suffered rejection. Russell is definitely a leader and not a follower, his soul purpose is to incorporate change; with his Neptune in Ophiuchus the 13th sign, he was born into a generation that have come to this world to save the Earth, this is a very influential placement since it brings in a wave of higher consciousness who’s mission is to achieve peace and justice, through transforming the way people think in a non-violent way. 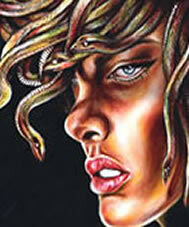 This generation of Neptune/Ophiuchus will pursue their spiritual values even if they have to die for them. 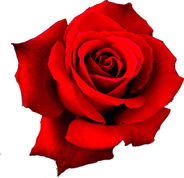 Russell is highly intuitive and this intuition will guide him on his search for truth; he is a disciplined and logical thinker and has all the makings to be a great spiritual leader just as long as he believes in his own abilities, because once he does then there will be no stopping him putting out a huge amount of inspiration and justice. Russell’s Black Moon Lilith is in the sign of Aquarius, this placement is all about power and the fear of powerlessness, it is one of never ending power struggles and can manifest into a fear of loneliness. Russell is a guy that has to get what he wants, his intense personal power even scares him at times, but this guy has skills that border on genius and his considerable air of authority alongside his diverse talents can either uplift you or crush you, I doubt he would be rivaled by many. This domineering character will test limits and boundaries to no end, but will slip off into isolation if ever he becomes overwhelmed by the feeling of powerlessness. Russell needs an outlet to channel this intense energy so that he can focus on sharing that power to the betterment of mankind.